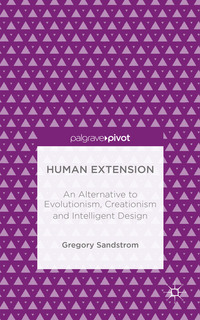 It’s a great pleasure to announce the publication of my first book – Human Extension: An Alternative to Evolutionism, Creationism and Intelligent Design. Basingstoke: Palgrave Macmillan, 2014. This introductory book critiques the Intelligent Design Movement and its ideology, in addition to documenting the exaggeration of ‘evolution’ as a biological theory into the ideology of ‘evolutionism’. The ideology of ‘creationism’ is given rather short thrift as unfortunately linked with fundamentalism and biblical literalism in the USA. This does not, however, discount theistic views of Creation across a range of beliefs. Of main interest is the idea of Human Extension and how it impacts the current landscape of views involving origins and processes of change-over-time. Thanks are expressed to the editors at NewGen and to the management at Palgrave Macmillan for their patient and consistent work on bringing this text to print in the Pivot Series. The Intelligent Design Movement: Revolution or Repatriation? This chapter analyzes the (post-)modern social movement that has begun with the concept-duo of intelligent design (ID). In the most ambitious words of one of the intelligent design movement’s (IDM’s) leaders, William Dembski, ID is named as ‘The Bridge’ between Science and Theology: “If you’re going to reject a reigning paradigm,” he explains, “you have to have a new improved paradigm with which to replace it. Naturalistic evolution is the reigning paradigm.” (Intelligent Design: The Bridge, 1999, 119) Needless to say, Dembski believes the concepts of intelligent design represent an academic replacement for naturalistic evolution compatible with both science and theology. Given these outspoken relative sentiments about ID theory, can and should we believe that the IDM’s scientific revolutionary declaration is practically possible? In this section we will make a brief inquiry on this topic. One doesn’t need to read far into ‘Intelligent Design’ (Big-ID) theory literature to discover the Intelligent Design Movement’s (IDM’s) refusal to study the supposed ‘Designer(s)’ of that which is said by IDists to be ‘Designed.’ This fact lowers the explanatory power of their theory immensely, almost entirely, even if Big-IDists don’t wish to acknowledge it for ideological purposes. An easy way to highlight this challenge is to speak of Big-ID and small-id, as I’ve done on this blog already. Discussion about this has also taken place in commentary at Uncommon Descent (UD), one of the IDM’s most popular blogs. Unfortunately, no consensus has yet been reached and thus no clarity to stop the waffling back and forth between the two terms. Likewise, no attempt to sort out when or even if capitalisation of ‘Intelligent Design’ is justified or if non-capitalisation of ‘intelligent design’ is always preferred or if the two linguistic expressions carry the same meaning has been made at UD. This could be done simply by dedicating a single thread to the issue. But for ideological purposes, this is likely not going to happen. In response to Aristotle’s Four Causes – Material, Efficient, Formal and Final – 20th century culture, media and technology theorist Marshall McLuhan – the so-called “Sage of the Wired Age” – came up with Four Effects: Retrieval, Reversal, Obsolescence and Enhancement (or Amplification). This blog post briefly outlines the Four Effects and then applies them along with Aristotle’s Four Causes to two contemporary topics: the Intelligent Design Movement and Darwinian Evolution. Big-ID and small-id – Why does it matter? I’m going to refer to this distinction here as Big-ID and small-id and support Gingerich’s position against the IDM. When it is said that Human Extension is an example of ‘neo-intelligent design’ (neo-id*) and an alternative to human evolution in social sciences, several clarifications seem needed in order to ease the reader’s conscience with respect to ideology. First, Human Extension did not originate within the ‘intelligent design’ (or ‘Intelligent Design’) paradigm promoted by the Discovery Institute in Seattle, Washington, USA. The Discovery Institute (DI) is the central institute supporting the development of ID theory and thus by definition (meaning DI-ID, IDM-ID or DI-IDM-ID) it is opposed by a neo-ID approach. I disagree with the main focus of DI-IDM-ID. The ‘neo’ feature of Human Extension denotes that it actually studies the ‘designer(s)’ rather than requiring that the designer(s) is not and cannot be part of ID theory, which is a central presupposition of DI-IDM-ID. Neo-id is a position that accepts that designers and design processes can be studied; Human Extension is an example of this. Evolution, Extinction or Extension: What is the Risk of Adopting the Wrong Anthropic Principle?